The Trek Collective: Titan petition breaks the 2000 mark! We're forty percent of the way to having a model USS Titan! Have you added your name to the petition? ...if more than 5,000 people sign up solemnly promising to buy a Titan or an Enterprise-F, we'll almost certainly do it. If anyone wants to make that happen then feel free - it's a serious offer. But, whatever you do, don't email me! I'm not going to count 5,000 emails. Ben later clarified that if we can gather five thousand names, and email contacts to hand over to Ben to arrange a pre-order, then that would be enough for him to commission a ship as an additional special issue in the series. With that offer made, the mission was obvious: Pick a ship, and gather five thousand names. There are several ships from the Star Trek litverse I would love to see included in the series, but I felt it would be best to focus on one at a time, and the strongest candidate to me seemed to be the USS Titan. The Titan is of course a canon ship (by name at least), and the design, by Sean Tourangeau, has also been around a bit longer than some of the other prominent litverse ships - As a result it's gotten around, having appeared not just on cover of Star Trek: Titan novels, but also in the pages of the Star Trek Magazine, in the comic series Hive, in Star Trek Online, and even as a large physical model at several Star Trek exhibitions! If you're interested in the history of the design, check out my Picturing the USS Titan article. The petition has been going for some time, and today, thanks to a signal boost from the Star Trek: Titan TV series campaign Facebook page, it has passed over the two-thousand name mark. There has been a constant trickle of support over the last couple of months, but by the normal daily rate of new supporters we're still a bit under two years away from the goal! I think we can beat that! We've got almost half way in less than three months! So once again I call upon all Titan fans to spread the word; tell friends, share the petition on Facebook and Twitter, blog about it, anything you can do to find those Titan fans! Thanks to all of you that have been shouting about it already. I'm sure this goal is achievable, and we will get the Titan, and hopefully the Aventine and others too. 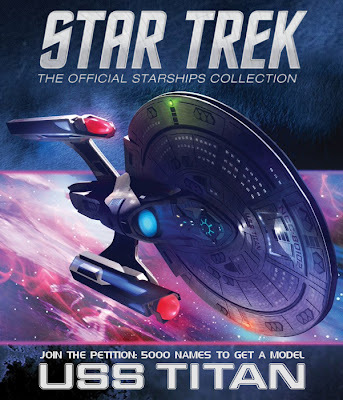 Join the petition: 5000 names to include the USS Titan in Star Trek: The Official Starships Collection.